Bringing Greenlawn Cemetery back to its original glory has been the goal of the Friends of Greenlawn since the day a small group of people gathered to talk about the cemetery. And then, one of the their dreams was to renovate and revitalize the Greenlawn Chapel, and that dream is about to come true. Greenlawn Cemetery has been receiving a face-lift for over a year now, and now the chapel is to receive its own part of this renovation. The PALS (Portsmouth Area Ladies Inc.) Ladies voted to help the Friends of Greenlawn purchase a door for the chapel. For quite some time, the Friends of Greenlawn, have had their hearts set on renovating the chapel. They had on their list of projects to get new windows and a door for the chapel. 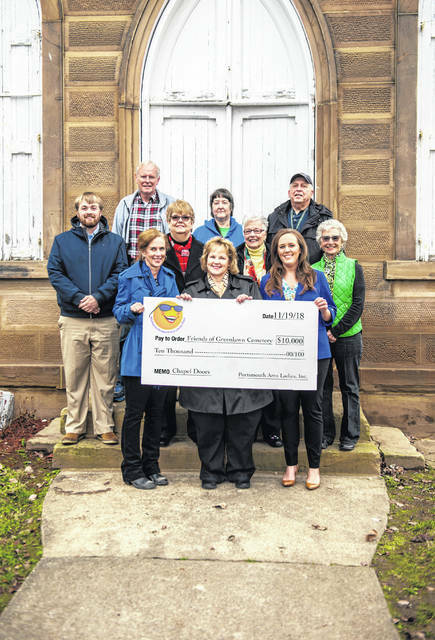 This idea was presented at the November meeting of the PALS group of ladies and that is when they took it upon themselves to help the Friends of Greenlawn and the entire community by purchasing the chapel door. The door to the chapel is not cheap, its total cost will be $10,000, one of the biggest expenses taken on by the Friends so far. The ladies of PALS try to take on projects that will help throughout the entire community, if at all possible. They give out money to several different projects throughout the year and this is one they were more than willing to add to their list of ways to help out. On their website they post:	PALS will engage in fundraising events and activities using volunteers to support charitable needs and organizations that will improve the quality of life and the changing needs of the residents in Portsmouth and the surrounding area. The two groups got together Monday morning to distribute the check and have a group photo in front of the chapel. Tanner Hatcher and Gambill were at the cemetery with some of the other members of the Friends of Greenlawn and the PALS ladies to receive the check donated by PALS. Hatcher spoke about how great it was to receive this donation. “It’s amazing to see the community behind something and I’ve not heard anything bad just great, good stuff, I love it, its positive, I love positivity,” said Hatcher. Gambill said they already have donations for two of the eight windows and they are taking sponsorships for the other six windows at $2,500, which includes the shutters, trim, locks and hinges for the windows. She said they were even taking some of the money they were going to use for the interior to help with the exterior. The Friends of Greenlawn still need sponsorships for the other six windows sponsored, and would love to take donations. After those are taken care of, everything on the outside would be finished and they could then concentrate on the interior of the chapel.